Best hikes in Picos de Europa National Park. COTALBA TO REQUEXÓN RIDGE: Pandecarmen - Ordiales Viewpoint - Cotalba (2.026m), Torre de la Canal Vaquera (2.040 m), 3rd Poyon (2.089 m) and the Requexón (2.174 m) - Collado Merines - Vegarredonga Hut - Pandecarmen. Requexon: West Face: A short scramble through a short but exposed gully (dif. III), Not easy to see from below. Half way of the gully there is a rappel point, you may continue over it or move a bit to the left. The descent follows the normal East route of Requexon (dif. I). 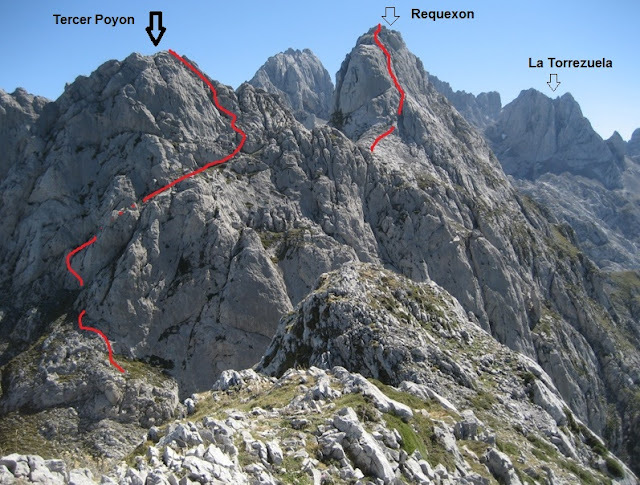 A very interesting activity consisting in climbing the whole line of mountains between the peaks Cotalba and Requexon, apart from visiting one of the highlights of the National Park: Ordiales Viewpoint. 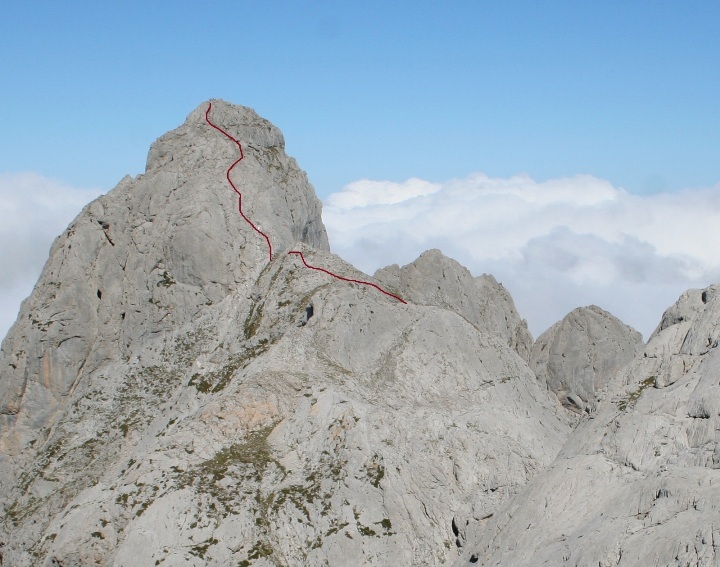 The first part of the route follow the marked trail PR-PNPE 5: MIRADOR DE ORDIALES. 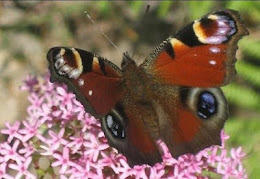 (see this link). From the Cotalba, we look for the best way to descent to Collada Sta. Maria, and then no problems to The Canal Vaquera Peak and the Horcada Vaquera. 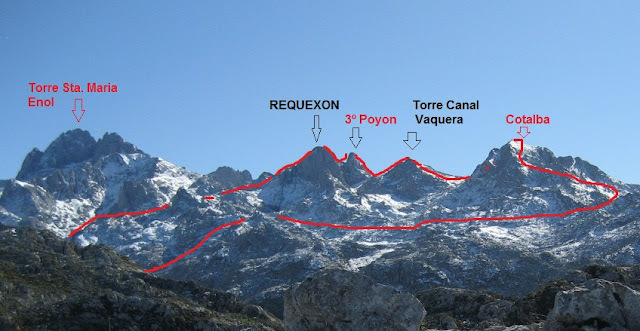 From the top, we see the West face of the Requexon. from here we descent towards the Horcada Requexon and head towards the last difficulty. The main difficulty of the whole route is in front of us, we began climbing without any clue, half way we see a rappel point. We can follow straight away or move a bit to our left. Anyway the way out is near. The scramble is not difficult but it is very exposed. Above us, the Poyones number 3, 2 and 1. The view from the Peak. And some of the peaks I will describe soon. We can see the descent route and the path we have to take. The descent follows the normal ascension route (dif. 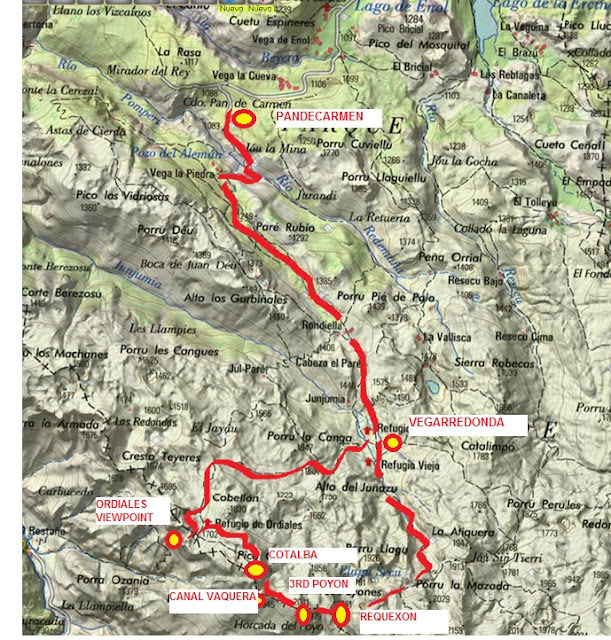 I) until the collado les Merines, and towards the swithcbaking trail in the meadows that will takes us towards Vegarredonda Hut.